The Certified Flight Communicator Course is a 2-day certification developed for communication specialists in the Air Medical field. 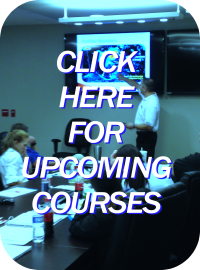 Topics covered include Flight Following and Navigation, Map Reading skills, Aviation weather, PAIP, Stress Management, Public Relations, and Medical Terminology to name a few. Following successful completion of the exam, status as a Certified Flight Communicator is earned. The Advanced Communication Specialist course is a 2-day certification developed for communication center managers, lead communicators as well as veteran communication specialists. Topics covered include Time Critical Decision Making in Aviation, Advanced Aviation Weather, Team Communications & Briefing/Debriefing, Risk Assessments, Recruitment & Retention, Disaster & Emergency Preparedness, Stress Recognition & Sleep Deprivation and Sharing Our Experiences & Knowledge. Following successful completion of the exam, status as an Advanced Communication Specialist is earned. Must be a paid member of IAMTCS during your 3 or 4 year certification period if certified prior to January 2014 (membership will be verified). Paid membership = payment of annual membership dues to IAMTCS. In-house company / program training. EMT / Paramedic training (refresher). Completion of Association of Air Medical Services' Medical Transport Leadership Institute (MTLI) or Safety Management Training Academy (SMTA). Auditing of a IAMTCS CFC course ($150 fee). No test will be administered or required if recertifying by one of these methods. Contact the IAMTCS Education Committee for more information about this option. SUBMISSION OF YOUR DOCUMENTS IS NOT REQUIRED AT TIME OF RECERTIFICATION, HOWEVER, IF YOU ARE RANDOMLY SELECTED TO AN AUDIT, YOU MUST PROVIDE CEU DOCUMENTATION TO INCLUDE DATES, TOPICS AND HOURS FOR EACH CEU. IAMTCS has partnered with Matt Currin and Convene Training to provide scenario-based continuing education for Communication Specialists. We encourage you to login and join the IAMTCS Group on the Convene First Responder site. Convene First Responders serve as easy-to-use, digital platforms for sharing your experiences with other members through scenario-based learning. All first responders have stories. Finally a platform where you can learn from others’ experiences. Learn more about Convene First Responders’ scenario-based training feature by clicking here.